​Federal prosecutors argued in court this week than a California man acted as the mastermind of the Silk Road online marketplace using the alias “Dread Pirate Roberts,” but his attorneys say their client isn’t who the government portrays him to be. 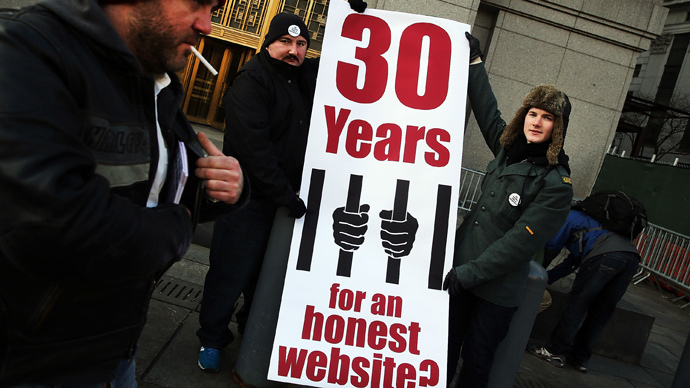 Attendees at Thursday’s hearing in New York City reported that Joshua Dratel, a defense attorney representing Ulbricht, argued in court that his client was set up ahead of his arrest and the simultaneous government-sanctioned seizure of Silk Road – an online marketplace where patrons could purchase contraband, including hard drugs, with cryptocurrency. Ulbricht was taken into custody on October 13, 2013. Although federal prosecutors have opted to portray Ulbricht as the brains behind the website – known under the administrator pseudonym “Dread Pirate Roberts” – Dratel argued that the defendant had been set up by the “real Dread Pirate Roberts,” according to Wired, which framed Ulbricht as “the perfect fall guy” in late 2013 before federal agents arrested him at a San Francisco library. On Thursday, Dratel had Homeland Security agent Jared Der-Yeghiayan acknowledge on the stand that United States investigators had previously considered 'Dread Pirate Roberts' to be Mark Karpeles – a French-born internet entrepreneur who ran the Mt. Gox bitcoin exchange until millions of dollars’ worth of cryptocurrency disappeared from the site last February, prompting it to file for bankruptcy in the US. “You thought you had probable cause that Mark Karpeles was intimately involved, as the head of Silk Road, correct?" Dratel asked Der-Yeghiayan during Thursday’s hearing, to which the agent affirmed, according to Ars Tecnica. Karpeles, who currently resides in Japan, publicly rejected those allegations soon after news from Thursday’s hearing trickled to the web. "This is probably going to be disappointing for you, but I am not Dread Pirate Roberts," Karpeles said in a statement. "The investigation reached that conclusion already – this is why I am not the one sitting during the Silk Road trial, and I can only feel defense attorney Joshua Dratel trying everything he can to point the attention away from his client." According to Ulbricht’s defense counsel, however, Karpeles had much more to gain with bitcoin by allegedly running Silk Road. The value of one bitcoin is only around one-fifth of that today. A second Silk Road, then a third, have appeared online since Ulbricht’s arrest and the original marketplace’s seizure, as well as myriad of other similar sites. Meanwhile, 'Forever' – a web hosting company started by Karpeles last year – announced earlier this month that it would be unexpectedly shutting down. “We deeply thank you all for using FOREVER.NET. However the decision has been made to close all services of FOREVER.NET on February 15th, 2015,” Karpeles wrote on January 7. The Ulbricht trial is scheduled to resume on Monday following a three-day weekend. Ulbricht, 30, has been charged with money laundering, computer hacking, conspiracy to traffic narcotics, and attempted murder. He faces a maximum sentence of life in prison.